KEEPER OF THE SNAILS: An Interview with Paul Halpern. 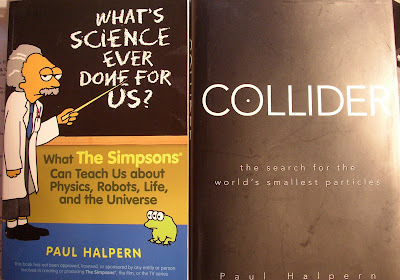 Yesterday, I posted a review of Paul Halpern's book, Collider: the search for the world's smallest particles. The author has now kindly agreed to answer a few questions about his book - as well as the usual selection of general questions. 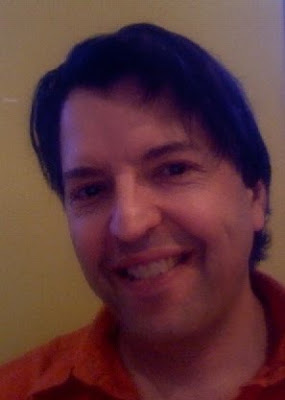 Dr. Paul Halpern is Professor of Physics at the University of the Sciences in Philadelphia. A prolific author, he has written twelve science books and dozens of articles. His interests range from space, time and higher dimensions to cultural aspects of science. The recipient of a Guggenheim Fellowship, Fulbright Scholarship, and an Athenaeum Literary Award, he has appeared on numerous television and radio programmes. His books have been favourably reviewed by the Los Angeles Times, the New Scientist, the Guardian and other publications. They include Time Journeys, Cosmic Wormholes, The Cyclical Serpent, Faraway Worlds, The Great Beyond, Brave New Universe, What's Science Ever Done for Us? and most recently Collider. 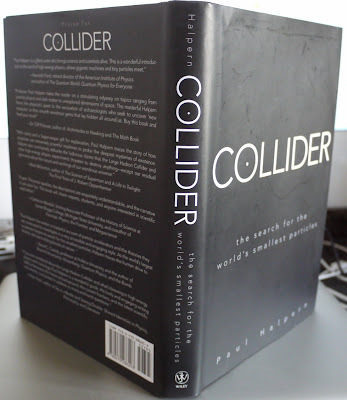 CD: Collider shows that what is known about the universe so far is the result of the work of a great number of theoretical physicists. Is there one that stands out for you? And if so, please can you tell me why? PH: Clearly, in terms of individual contributions to modern physics, Einstein’s were the most significant. His insights about the abandonment of absolute space and time, the conversion of mass into energy, the quantum nature of light, and the warping of the fabric of the universe to produce gravity were each incredibly important contributions. Yet there are so many lesser-known physicists, such as Wolfgang Pauli, Max Born, Louis de Broglie and such, without whose efforts modern physics may have taken a different course. CD: I particularly liked the way you described the variety of particles that were confronting physicists by the mid 1990s. Which of these particles is your favourite and why? PH: Loyalty to my PhD university, Stony Brook, compels me to say the top quark, since physicists from that university played an important role in its discovery. But for humour value, the bottom quark, also known as beauty, used to generate lots of chuckles. I recall research seminar announcements in the 1980s advertising the search for ‘naked beauty’ and ‘bare bottoms’ (meaning displaying the quantum number associated with that quark). I couldn’t imagine how researchers kept a straight face while delivering talks on such topics! CD: What would you say was the most challenging theoretical problem facing theoretical physicists today? CD: And what is the most challenging practical problem? PH: The most challenging practical problem is finding ways of building up to the energies needed to test theoretical predictions. Hopefully, the LHC will have a long, healthy run after its restart in November. But what if its results raise questions that require even higher energies? Would there be the funds and the will to build an even more powerful collider? CD: You outline the difficulties when the Superconducting Super Collider (SSC) was declined further funding in 1993. In some ways it is a lament for theoretical physics in the United States. What do you think were the main reasons the LHC was built but the SSC was not? PH: First of all CERN had much of the infrastructure in place to support the LHC. It was planned as an extension of existing facilities. The SSC was essentially built from scratch in a region in Texas where there had been no facilities before. Second, Europe engages in much more long-term planning, whereas in the United States budgets are largely decided year to year and different administrations often radically alter priorities. CD: This week it was reported that the LHC is to work at half energy until technical difficulties are solved. What impact will this have on research work? PH: I think researchers are happy that a machine will be running with much more power than the current champion, Fermilab. However, with half the power, there would be a whole range of mass left unexplored until the LHC is running at full capacity. CD: What major practical project would you like to see next? PH: I would like to see an international drive toward renewable energy sources, such as solar and wind power, and also greater effort to eliminate nuclear weapons. In terms of physics I will be happy to see the LHC churning out data and would hope that successor devices are built whenever the need arises. PH: Though my wife informs me that there are snails in our back garden, I’ve only seen slugs, and there are plenty of those. Sometimes the slugs startle me when they pop out of tin cans in our recycling bins when I least expect them. The moment of shock is invigorating, and good exercise for the heart. PH: In adult life, witnessing the birth of each of my sons was a highly moving experience and I continue to be very proud of the two of them. In youth, it may well have been passing my driving exam. I won’t say how many times I attempted it and was thwarted by various mistakes. I received a competitive grant to pay for my entire university education (usually very expensive in the U.S.) around the same time that I earned my license, and I was happier about the fact that I had conquered a rather severe aversion toward driving. Nevertheless, I still greatly prefer trains over cars. PH: The final years of my postgraduate education showed me that I could muster up the intense concentration needed to publish research articles in theoretical physics but proved to me that I wouldn’t be happy doing that exclusively to the detriment of other facets of my life. Rather, those years pointed me toward taking up science writing, which I started shortly after I received my PhD, and also toward trying to keep up a varied existence, including as much travelling as I can fit in (and afford). PH: Even though my grandmother lived to the ripe old age of 98, it was very hard for me to see such a proud, independent woman decline so much in her last few years. I dedicated my first book to her when she was 85 and she managed to conduct a fairly active lifestyle for almost a decade after that. I greatly miss the stories she used to tell, such as sitting in the park when she was a girl and hearing the famous composer John Philip Sousa perform. PH: I’d like to spend less time worrying about things and more time living in the present moment. But I’m trying not to worry about that goal too much. PH: I read recently a piece by Colin Wilson who described a feeling of everything being right with the world, but that moment of contentment vanishes when it is analysed too much. Very true! For my happy scene, I can imagine sitting with my family on comfortable sofas in a beautiful old library, reading wonderfully interesting books, while taking moments to glance out a large picture window upon a stunning Alpine landscape. Ahhh! PH: Usually it is all a blur until I am on the train to the university where I teach. But I think I somehow get myself together while helping to make sure the kids are off to school. If I find myself on a school bus, and they are on a train I know that I have somehow muddled it up! Fantastic interview Clare - as always. Talk about widening the known world! And yet, I also enjoyed Paul's grounded side that your questions brought out. Thanks to both of you..
PH: I would like to see an international drive toward renewable energy sources, such as solar and wind power, and also greater effort to eliminate nuclear weapons. Good question, but Dr Halpern didn't answer directly... I guess he couldn't, since the LHC is built for fundamental research and the practical applications are unpredictable. I mean by "unpredictable" that they'll probably be marvelous, but hard to predict right now. Thanks Kay! Fascinating stuff, isn't it? Yes, Gilles, some of my questions are unanswerable, sometimes - but my more courteous interviewees still endeavour to answer them. I feel privileged to have the opportunity. Yes, I suspect the applications will be marvellous too.